Security forces attacked workers celebrating May Day in different cities across Iran. 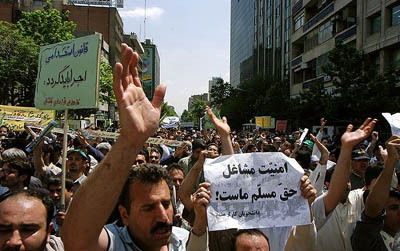 In Tehran, in which only the government-sponsored Workers’ House is legally permitted to hold rallies, thousands of workers with independent slogans participated in the event at the Shiroodi (former Amjadie) stadium and did not let the official event conclude. Alireza Mahjoub, the head of the Workers’ House, was interrupted by chanting workers and could not finish his speech. The Workers’ House’s authorities and hundreds of security forces on site tried to end the event hurriedly in order to prevent workers from marching towards the streets of Tehran but about 7 thousands workers left the Stadium and marched towards the 7 Tir Square. However, they were attacked by security forces throughout their march. Security forces closed most intersections and roads on the way of marchers which caused protesters to eventually disperse. In Sanandaj, workers had requested a march on the streets of Sanandaj but the governor office refused to give them the permission; as the result, workers decided to rally in front of the office of the Labour Relation of the city of Sanandaj. The first groups of people, about 400, who had gathered for early in front of the Labour Office were surrounded by tens of security and intelligent forces. After the resolution of this year’s May Day was read by Mr. Sheys Amani, the Chair of the National Union of Sacked and Unemployed Workers, police attacked the demonstrators and beat and arrested many. Mr. Amani was beaten as well as other known labour activists, including Mr. Khaled Savari, Sadigh Karimi the deputy Chair of the Union who was severely beaten and has been arrested since then; Mr. Behzad Sohrabi and Hossein Ghaderi were also injured. After the attack, families and supporters of the arrested workers were gathered outside the police station 12, where they were attacked by the security forces. Throughout these events workers chanted similar slogans including: “Arrested Workers Must be Freed”, “Free Mahmoud Salehi Now”, “Long Live May Day,” “Ban Child Labour”, “Right to Organize and Strike”, “We deserve a decent living”, “The Incompetent Labour Minister, Resign! Resign!” “Stop Temporary Employment Contracts”, “Increase Minimum Wage”, Workers, Teachers, Students, Unite!“ and so on. Workers have condemned the 1386 (March 21, 2007- March 20, 2008) monthly minimum wage of 183,000 Toman (less than US$200). Workers demand the minimum wage to be established at least three times higher than the current rate in order to achieve a living wage. In almost all events in Iran workers demanded the release of Mahmoud Salehi from the prison, as well as the right to organize, strike, assembly and freedom of speech. Workers have also called for solidarity with migrant workers in Iran as well as solidarity with workers around the world. The right to organize May Day events without government and security forces intrusions was also another demand. In Tehran, Sanandaj and other areas workers also condemned arms races between different countries as well as sanctions and militarily intervention against Iran by the Western powers as working people and poor will be the main victims of such inexcusable actions. Mahmoud Salehi and a number of his colleagues have gone on a 24-hour hunger strike in protest to their imprisonment. He has also sent a May Day solidarity greeting in which he has promised to continue with his struggles for workers’ rights inside or outside the prison. It is also reported from Tehran that Mansour Ossanlou, the president of the Syndicate of Workers of Tehran and Suburbs Bus Company and two other board members of the union were attacked, on their way back from the May Day event, by over 15 police officers today and Ossanlou was beaten and arrested briefly. There have been numerous May Day celebrations in Iran, including a large event near Tehran and Karaj with about 5 thousands participants at Abshar khour. Tens of resolutions have been issued by numerous independent workers’ organizations and groups and many indoor events have been taking place. Teachers’ organizations have also called for a large demonstration, today, May 2, 2007.